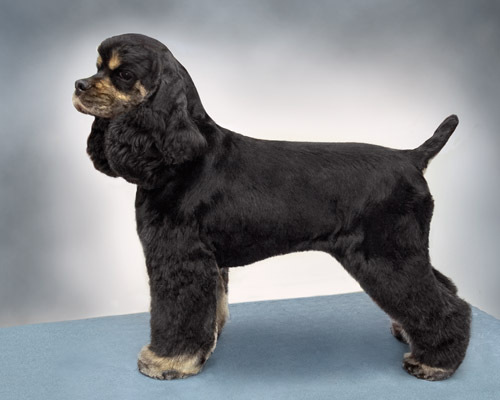 The American Cocker Spaniel is the smallest of the sporting dogs. It is a happy merry dog with a tail that never seems to stop wagging. Capturing its expression is very important as in any breed. It can be difficult to maintain without the coat matting due to their heavy coat and undercoat. For this reason recommend owners to have them groomed on a regular 4, 5 or 6 week grooming schedule. The length of this trim can be modified based on the condition of the coat when the dog returns for its next grooming appointment. It is important to find the right length based on the client’s lifestyle and grooming schedule. If the client agrees to have their dog groomed on a 4-6 week schedule, then you can leave more coat than a dog that only gets groomed every 2-3 months. Starting with the ears, clip the ear leather either against the grain with a 10 blade or with the grain with a 15 blade. A 10 blade against the grain gives a nice clean look. The sensitivity of the skin will determine which blade to use. Start your clipper work at the bottom of the ear leather fold. A good point of reference as to where the clipper work should go down to on the ear is at the jaw line. If the dog has a high ear set the leather fold will be above the jaw line. In this case it may be necessary to lower the clipped area to the jaw line to give the illusion of a longer ear and better ear set. The bottom of the clipped area can be either in a “V” shape which really elongates the ear or a “U” shape. Both of these are acceptable and a matter of personal preference. Clip the ear leather to the top of the ear approximately one finger width into the skull. Whichever pattern is clipped on the outside of the ear should also be done the same way on the inside of the ear leather. Clip the inside of the ear with a 15 blade against the grain. Clip the cheek from the ear toward the eye with a 10 blade clipping against the grain. The clipped line should be from the outside corner of the top of the ear to the outside corner of the eye. Clip the throat from two fingers above the breastbone against the grain up to the chin with a 10 blade. On sensitive skin a 15 or 10 blade can be used with the grain. Clip from under the ear down to where the neck meets the scapula blending off over the scapula. The entire throat should be clipped very clean with a 10 blade. Clip between the eyes in the stop area creating an inverted “V” with a 10 blade. Using a 15 blade, clip under the eyes to create chiseling. Clip the muzzle with a 10 blade lightly to give a plush appearance. 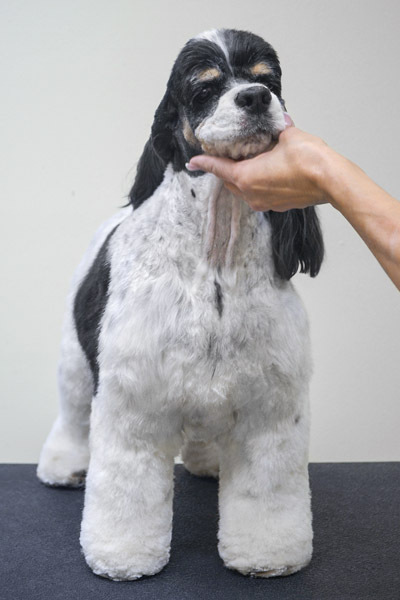 A 7F or thinning shears may be used on a dog that has a snippy muzzle to give a fuller appearance. Clipping the muzzle too close will make the dog look cheeky and the muzzle snippy. Clip the flews with a 15 blade. The muzzle should be the same width as the side skull. Using a 7F blade against the grain clip from where the 10 blade work stops at the top of the ear up into the skull to blend the 10 blade work into the crown. Use thinning shears to remove all hair on the eyebrows. This is an important step to capturing the breed’s expression. This is also the hair that falls in the eyes which is why most pet owners do not like the crown. Once the brow hair is removed the crown will stay back out of the eyes. Brush the entire crown over to one side and use thinning shears to blend into the clipped area of the side skull. Repeat for the opposite side. Never comb the crown forward and trim the long hair as this will flatten the top of the skull. The sides of the skull should be very tight and should be the same width as the muzzle. Leaving too much coat on the side skull will make the muzzle look narrow. The crown area consists of a semi-circle from the outside corner of the eye, over the top of the skull to the opposite outside corner of the eye. Some dogs may need more crown than others depending on their skull and what is needed to create the dome. The top of the skull, between the ears, should be tight and well-blended with no obvious clipper lines. The back skull should be thinned tight to the occiput. This breed should be hand stripped, however, most pet trims are clipped. When clipping the back coat, a 4F, 5F or 7F blade can be used. Blend off with your clipper into the longer side coat so no clipped lines are seen. Never clip the back coat shorter than a 7F as it is not healthy for the skin and does not look natural. It is very difficult to blend the transition line from the back coat into the furnishings when a short blade is used. Go over the entire clipped area with a stripping knife to remove undercoat. This will give a natural appearance and will keep the back coat looking nice and shiny. 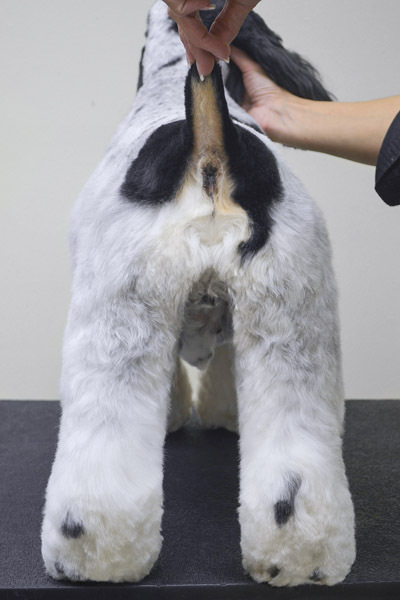 Thinning shears may be used to blend in the clipped area to longer side coat and leg furnishings giving a natural appearance. When clipping the hip area create a subtle “V” to show the hip muscle. To determine how much of the hip should be clipped, open your hand and place it over the hip, with your thumb on the dog’s pin bone (or point of rump). The area between your thumb and index finger will create a “V” shape. The area within the “V” of your fingers should be set tight. Clip the underside of the tail with a 10 blade. Clip the top side of the tail with the same blade used on the back. Use a snap-on comb to set the length of the legs and skirt. Clip the back legs following the shape of the leg. Using the same comb clip the side coat following the shape of the rib cage. Clip the back, the inside and outside of the front legs with the same comb. Leave the front of the front legs to scissor later. The size of the snap-on comb that you use will be determined by what the pet owner prefers. It will also depend on how often the dog is being groomed. If the dog is groomed on a four to five week schedule a ¾” or 1” comb may be used. However, if the dog is not on a good grooming schedule it may be necessary to use a ½” comb. Once you set the length you can now begin to scissor everything in. Starting with the back feet, scissor the base of the foot in round. Using curved shears scissor the rear angulation. The tightest point of the angulation is where the back leg bends at the stifle. Scissor from the bend of the back leg to the hock. Comb the coat up on the leg and scissor from the hip down to the feet creating parallel lines. Follow the bend of the thigh muscle and stifle. Scissor the feet so they are nice and round. Comb up the inside of the rear leg and scissor it in the same manner creating a parallel line. Comb the side coat down and scissor in the underline leaving a tuck up. Comb up the side coat. Using curved shears neaten the side coat following the roundness of the rib cage. Scissor the base of the front feet in so they are also round in appearance. Comb up the coat on the entire front leg. Scissor the back of the front leg straight from the elbow down to the back pad. Scissor the outside of the front leg straight from the shoulder down to the feet. Scissor the inside of the front leg straight from the armpit to the feet. Comb up the front of the front leg and scissor a straight line down to the front toes. This will create a nice column look. Comb up the coat on the chest and scissor it in to blend into the shoulders. Lift up the front leg and scissor the chest to meet the underline. Use thinning shears to neaten all of the lines where the clipped back meets the longer coat. Trim the ears so they are curved from the back of the ear to the front of the ear. The ears should never fall lower than the point of shoulder. 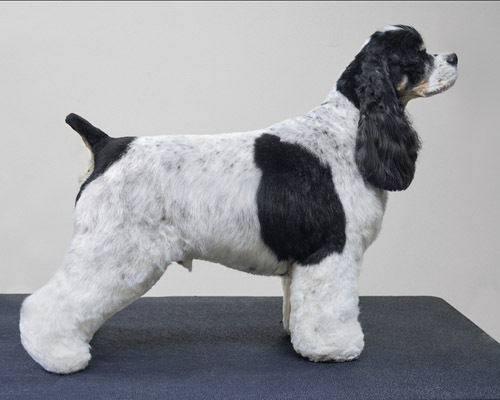 The finished trim is very flattering to this breed and is easy to maintain if you select the right length. For dogs that have problems matting, especially in the body furnishings, clip the entire body with the same blade that was used for the back coat. Leave the legs the same length as the previous trim. Clip the entire front chest as well. Leave a little coat in the tuck up area to transition the body into the rear legs. This is a stylish trim that is very easy to maintain and looks very attractive. Holistic Grooming: What’s It All About?